All International Energy Agency scenarios show renewables growth won’t deliver a climate cure. The situation is particularly grave in Asia, where coal plants are supposed to carry on running for decades. None of the scenarios in the latest International Energy Agency World Energy Outlook show renewables growing fast enough to meet global climate goals. Under current policies, said the IEA this week, the world would see increasing strains on almost all aspects of energy security and “a major additional rise” in energy-related carbon emissions. And under a new policies scenario, incorporating measures and targets already announced by governments worldwide, global energy demand would still grow by more than a quarter through 2040, leading to increased demand for oil. Even under a sustainable development scenario, aimed at achieving the energy goals of the United Nations Sustainable Development agenda and the long-term objectives of the Paris Agreement, renewables growth falls short of delivering a climate change cure. Instead, said the IEA, society would also need to rely on energy efficiency and largely untested technologies such as renewable hydrogen synthesis and carbon capture, utilization and storage, as well as write off current investments in new coal plants. 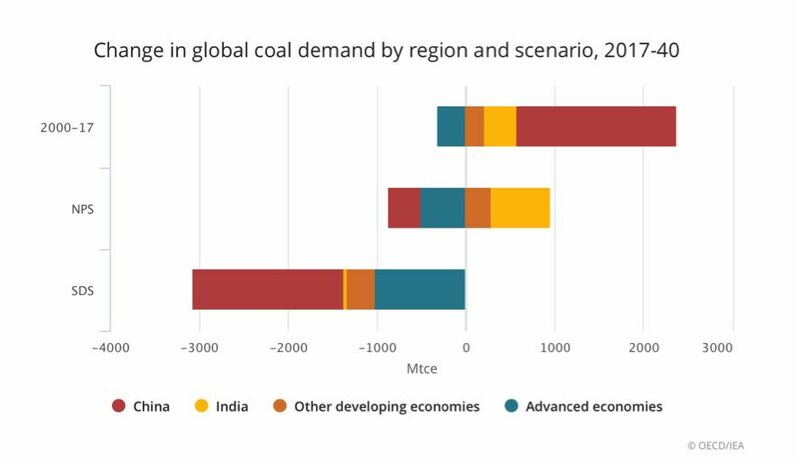 The situation is particularly grave in Asia, where coal plants have an average age of 11 years old and are supposed to carry on running for decades, compared to the 40-year average age of coal-fired generation assets in the U.S. and Europe, said the IEA. 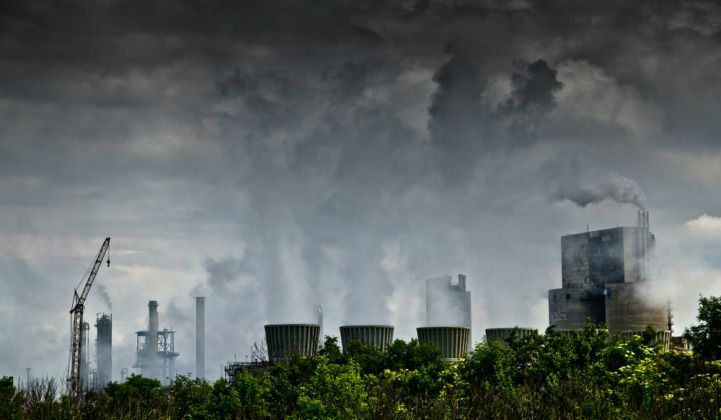 In press materials, the IEA’s executive director Dr. Fatih Birol said the agency had reviewed all current and under-construction energy infrastructure around the world and found it would account for around 95 percent of all emissions permitted under international climate targets. “This means that if the world is serious about meeting its climate targets, then, as of today, there needs to be a systematic preference for investment in sustainable energy technologies,” Birol said. In the IEA’s sustainable development scenario, electrification grows strongly, but so too does the direct use of renewables such as bioenergy, solar and geothermal to provide heat and mobility. The share of renewables in the power mix would need to rise from a quarter today to two-thirds in 2040. For heating it would need to go up from 10 percent today to 25 percent in 2040, and in transport it would need to rise from 3.5 percent to 19 percent. The scenario foresees vast increases in wind and solar PV generation, up from 1.5 petawatt-hours a year in 2017 to 14.1 petawatt-hours in 2040. Electric vehicle adoption would also have to soar, from 9.2 million cars in 2017 to more than 933 million in 2040. Wind, solar and electric vehicles are all commercially viable industries, though. Under the sustainable development scenario, CCUS would have to go from capturing 22.7 gigatons of carbon dioxide in 2017 to more than 2,364 gigatons in 2040, or more than a hundredfold increase in 23 years. Even organizations that stood to gain under the IEA scenarios offered guarded responses to the latest World Energy Outlook. Noting that the IEA has shortened the length of time in its forecast at which wind would become the largest grid power source in Europe, Giles Dickson, CEO at the industry body WindEurope, said, “While it'll be good to be No. 1 in electricity, electricity is only 24 percent of Europe's energy." "To decarbonize the whole energy system, we're going have to start getting large amounts of wind and other renewables into heating, transport and industrial processes," he added. On the plus side, though, the IEA’s annual World Energy Outlook scenarios have historically been criticized for underestimating renewables growth. The Eindhoven University of Technology researcher Auke Hoekstra, for example, has shown that World Energy Outlook reference and new policy scenarios for solar energy capacity additions have been massively beneath what has happened in real life. Policymakers may be hoping the same is true this year. But it might be necessary not to wait too long to find out.